I like to think of Marisole as the love child of Halle Barry, a Bratz doll and possibly some sort of insect. I actually drew this doll originally for the old incarnation of this site, but ended up never really doing much with her. 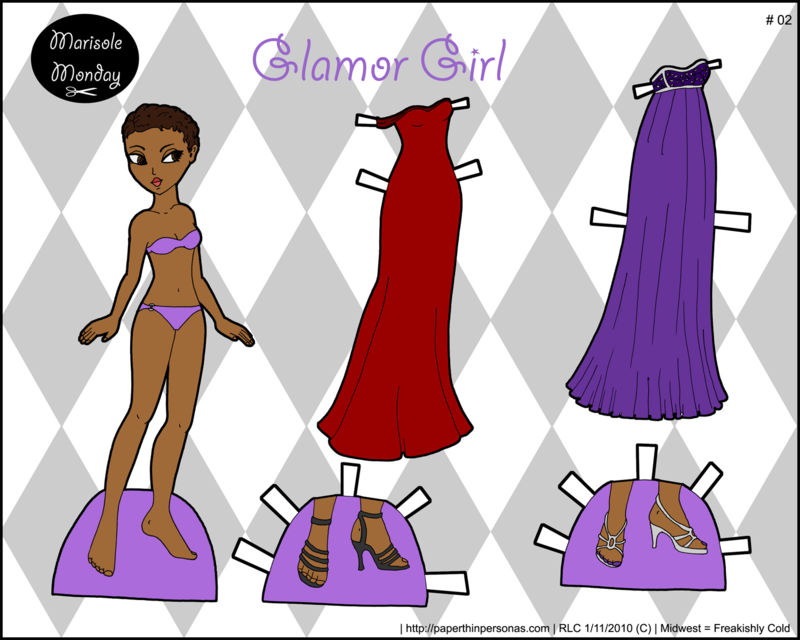 I always liked her, and so I’ve decided to post one Marisole paper doll every Monday. I didn’t really mean for her to look like Halle Berry, but once I was done she really reminded me of her. On a slightly unrelated note, there is snow on the ground and I am rather enjoying it. It’s so beautiful and white and it reminds me of home. I would much rather have it 20 degrees and snowing then have it be 14 degrees and not a flake on the ground. I’m not sure my poor snow covered car agrees with me though. To go back to the paper dolls, momentarily, there will be another paper doll post on Wednesday and then a Florence on Friday. At least, those are my plans at the moment. They may change at any instant. So, I am very excited to reveal here the mostly finished new version of Paper Thin Personas. Yes, I lost everything, but now is a time for rebuilding and creating new things. (This is me trying to be positive.) There’s still some work to be done and it’s not perfect yet, but it is on it’s way. I’m excited. 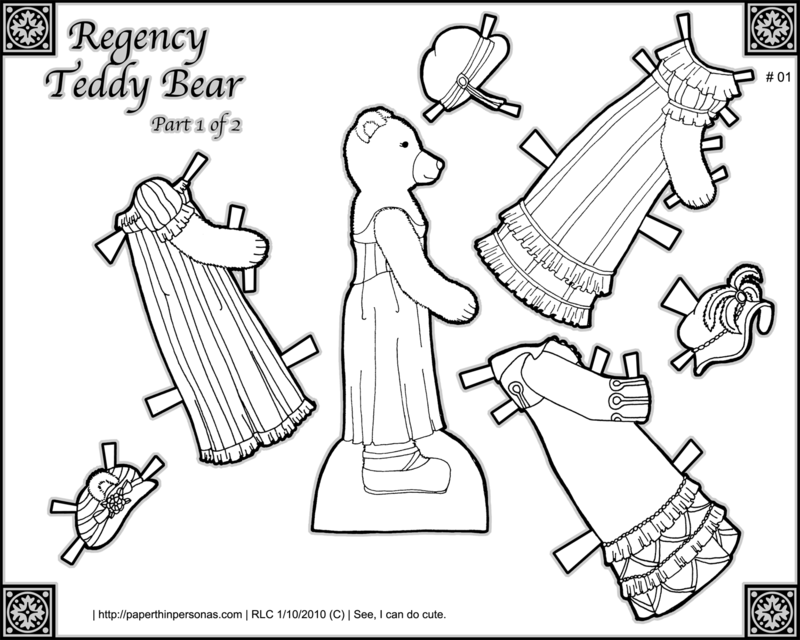 So, enjoy the Regency Teddy Bear paper doll. A more coherent post may come on Monday, but no promises. Edit: I’ve posted the second page of this paper doll. You can get the teddy bear’s other clothes here. Back in July, I tried to update the blog from WordPress 2.7.1 to 2.8. The result was the loss of massive files, deletion of part of the site and a full crash. Fortunately, that time I was able to successfully resurrect the blog from the ashes. I really should have learned my lesson. There is, as usual, good news and bad news. The good news is that all of the image files remain safely on my external hard drive. The bad news is that all of the other site content has gone wherever good sites go when they die. Maybe someday I’ll be able to return it from the dead, but until then, it’s going to stay dead. What does this mean for the future? Well, the blog isn’t over. I have had a lot of fun with it over the past year and I’m not about to give it up. I am trying to see this event in a bad light, but rather as an opportunity to try something new. For the moment, there’s not much here. But hopefully by the end of January, the blog will be back up and running smoothly. Feel free to leave any comments or thoughts you might have. Things will be rough around here until I get everything back sorted, but I have faith it’ll work out. Also, I’ll just never update my WordPress version ever ever again.